Nadi Palshikar is a doctor by profession and has studied screenplay writing at famed FTII, Pune. She has also done a course in Women’s Studies at Pune University. She has a keen interest in cinema. She is a wife and a mother. She has served women patients from the lower section of society and studies the health issues of Muslim women. Her vast and diverse experience has certainly enriched the content and its delivery in this novel, which is her first. An avid reader is always on a lookout for a good read. For me, a quick and easy read is interesting and captivating. As the name suggests the book denotes an Indian setting and captures the emotions effortlessly. 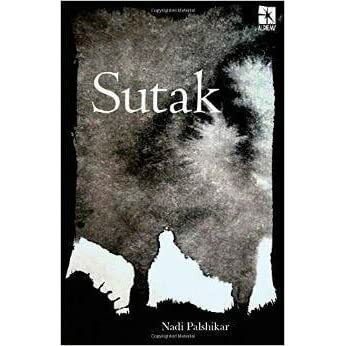 The title- Sutak- means the twelve days long mourning of death. The story revolves around the life of Lalita. It covers the aspects from her childhood and describes her role as a mother and a sister. Vinodini is always there and around, and it is she who provides a context here, a reference there, an undercurrent beneath, and so on. At times, she appears as the alter-ego of Lalita, making her complete, and at times, she becomes the outgrowth and expansion of Lalita providing her much-needed breathing space. That’s why, to me, she is equally a protagonist along with Lalita. Both sisters are different in temperament and have different lives. They inhabit the same social milieu. Just shades and hues appear different. But are they really different? Or, they complement each other? Both are the heroine of the story. But, they don’t do extraordinary things. They are also not in extraordinary situations. Still, they are heroines because they try to shape their lives themselves. They do so with sublime and simple attitude. The process is so ‘moving on’ type, however, no one is able to move on till the last page, and when they begin to move on in the real sense of the term, they move together with their rediscovered and repaired individuality. The very ordinariness of their being an act gives this story of a mundane situation a monumental dimension. The characters and their interactions stay with you for long after you have turned the last page over. They haunt because they are so ordinary, and because they are so ordinary, they become our story. The narration actually differentiates a good writer from the average. This is so evident in this book. The narration of Nadi with just enough characters in the book makes an ordinary story worth a read. The narration keeps in mind the everyday lingo that we use. The other character like ved is like friend everyone has. To explore the talent of the master storyteller you need to read this book. The positives of the story are the characters easily identifiable. Even though the narration is again easy to read and allows us to easily go through the entire story, the tale is spread over long 24 years, but the novelist has chosen present tense all through, and the story is intertwined in the past and the present. This style provides a simultaneous telling of many stories happened at different times together. The reader is immersed between the layers of the internal as well as the external upheavals of various characters. There are many episodes that remain with you long after you keep the book back on the shelf. Lalita is so scared of cats that mere mention can disturb her, but when Vinodini’s cat is in pain while trying to give birth to her babies. Although the narration of the story is good but in my opinion, the character of Vinodini and the relationship with Lalita could have been explored in detail. Even Vinodini looks a little underplayed. Overall if asked I would say this is good job done by the author, the book is interesting and a fast read. The writer makes a storyline interesting with her narration abilities. I would give 4 stars to this book.